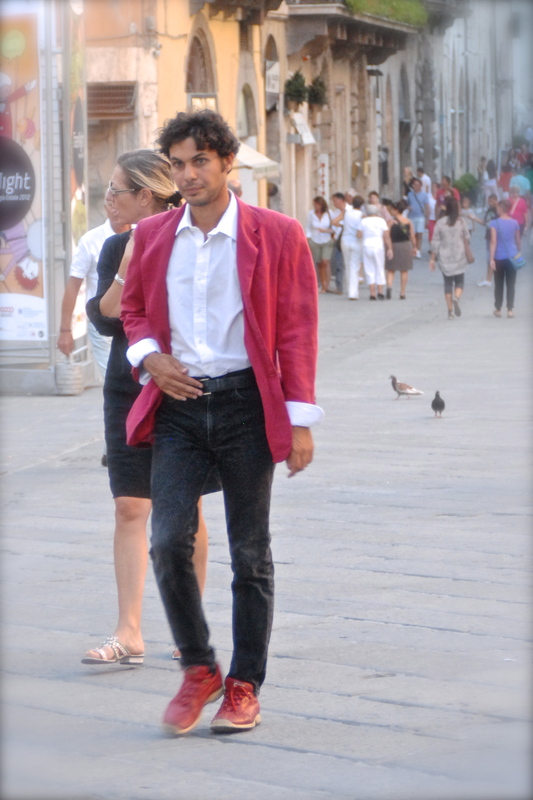 Here’s a little follow-up to yesterday’s observations on Italian summer fashion. 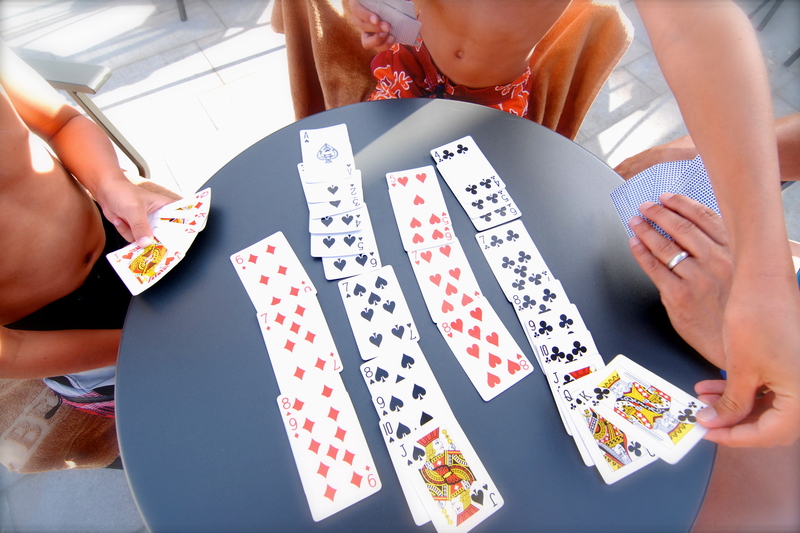 I first noticed this trend at the swimming pool, but the colors come out in full force during the evening passeggiata. Italian men, women, and children are wearing the American flag. And it’s not just limited to shirts. 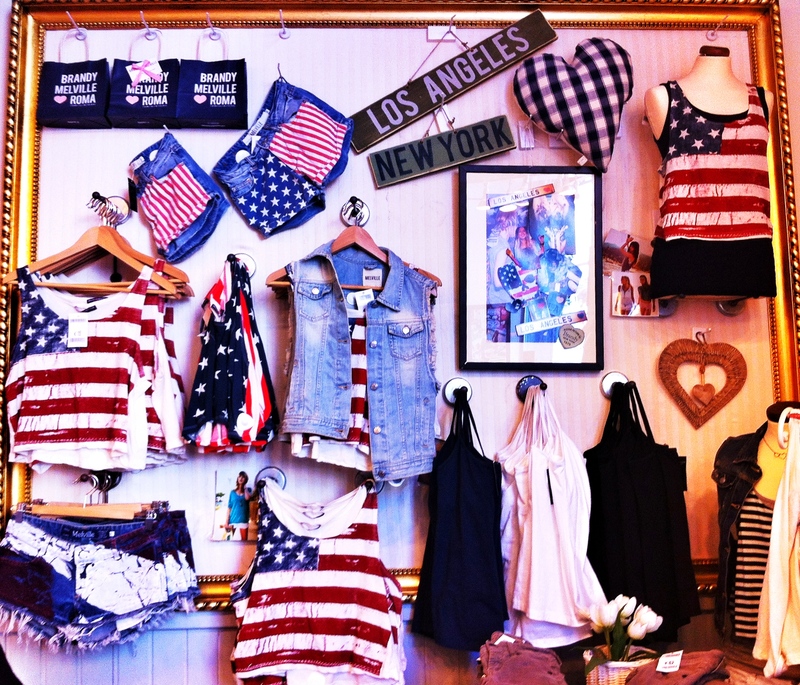 The stars and stripes are blazoned on bikinis, scarves, hats, shorts, skirts, tanks, and sweatshirts. 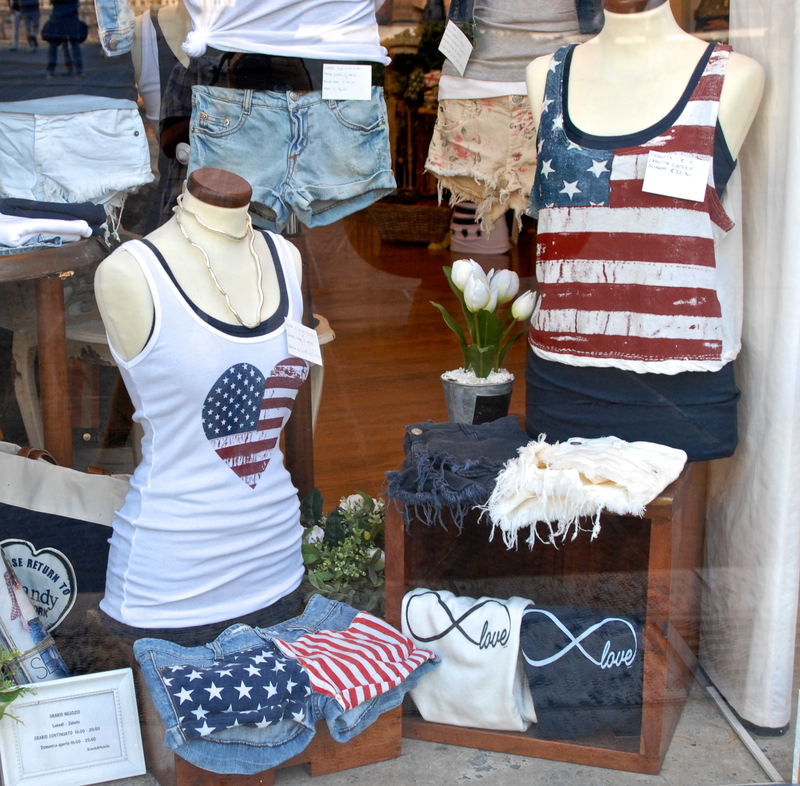 On Corso Vannucci alone, there are at least 10 window displays that include Old Glory apparel. At first I expected to see familiar slogans attached like, “Don’t tread on me”, “These colors don’t run”, and “Freedom isn’t free”. Instead, the Italians seem to pair the flag with hearts. In fact, it’s not uncommon to find the flag in the shape of a heart. 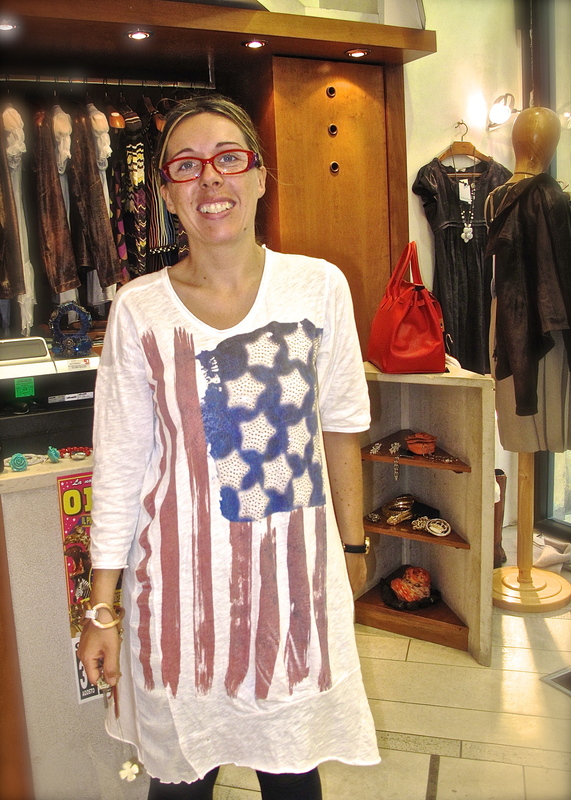 From my limited experience here in Perugia, I’ve found that the Italians love all things American. The first question people ask once a conversation starts is, “Where are you from?” When we answer the United States, they smile; they light up; they often swoon. “My dream is to see America!” is a typical response. This favorable impression has been reassuring. When we arrived, I expected to encounter a little chill. I didn’t know how the Italians felt about the war, fast food, or giant Starbucks lattes. I worried there may be blame and negative judgement directed at us. All those fears are at rest; people are nicer to us once they learn we are American. However, I still wanted to find out what the flag craze is all about. So this week, I went into a store and asked the shop keeper if she could explain its popularity. She said that it started last fall when Ralph Lauren featured the American flag on some of his clothes. Ralph Lauren is a big deal, she continued. Italians love his line, so when he added this little design, it exploded. The flag has been very popular since November. By the way, I’m not a big follower of the fashion giants like Ralph Lauren. I tried to learn more about this pivotal fall insignia, but my search has revealed nothing. Let me know if you’re familiar with what she’s talking about. Until then, I’ll resist buying Matt a red, white and blue speedo. This shopkeeper told me she had just recently sold out of this shirt. 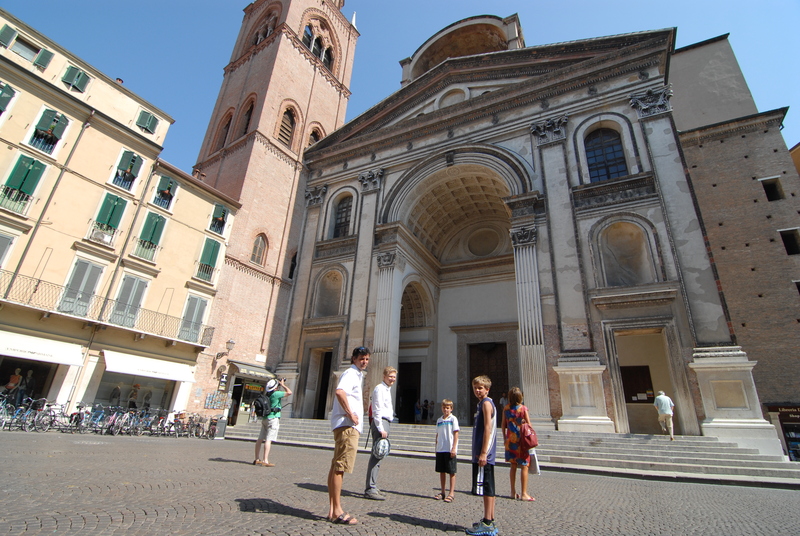 Corso Vannucci intersects the historic center of Perugia just one block from our apartment. This is the main street – a pedestrian only street – where Perugians take their evening stroll (la passeggiata). 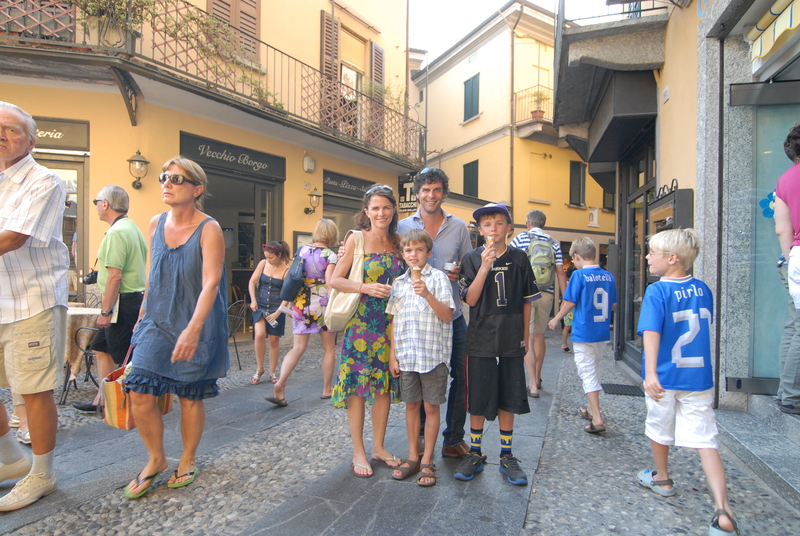 In every Italian city beginning every night around 6:30 pm, the energy of the town goes up a couple notches. The women dress up. The men might dress up. Friends, couples and families join the crowds for a couple hours before dinner. It’s the most vibrant time of the day. We can hear the noise from our windows. When we look outside, the gelato line extends past the doors. The outside cafes start to fill up. 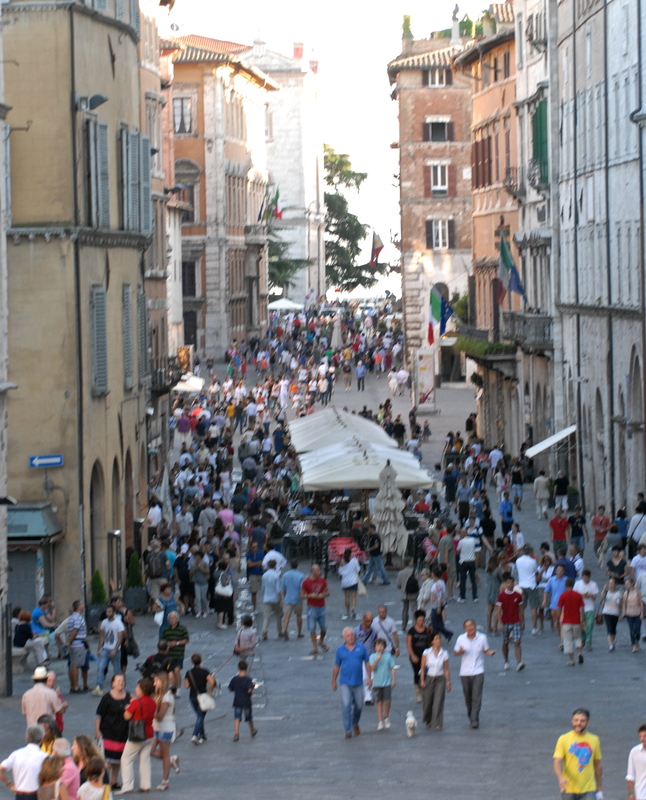 The streets crowd with people walking slowly from “Piazza Italia” to “Piazza IV Novembre” and back again. Often they’ll pause, light a cigarette, and look in a fancy window display or stop for an aperitif (more on that later this week.) It’s hard to resist. As we join in the parade, we realize it’s not about the destination (because, like I said, you just go up and down the street). Instead, it’s about seeing and being seen. It marks the festive transition from the work day to an enjoyable evening. It’s about getting a second wind before you start cooking in a hot kitchen. And for us, it’s also an introduction to Italian fashion. I don’t pretend to be an expert on dressing well (I just got rid of my fanny pack a few years ago) but here are a few observations. Skinny jeans and bright colors. Pop. Big, bold necklaces. Even mom’s shirt is wearing one. Sandals that cover the ankles. 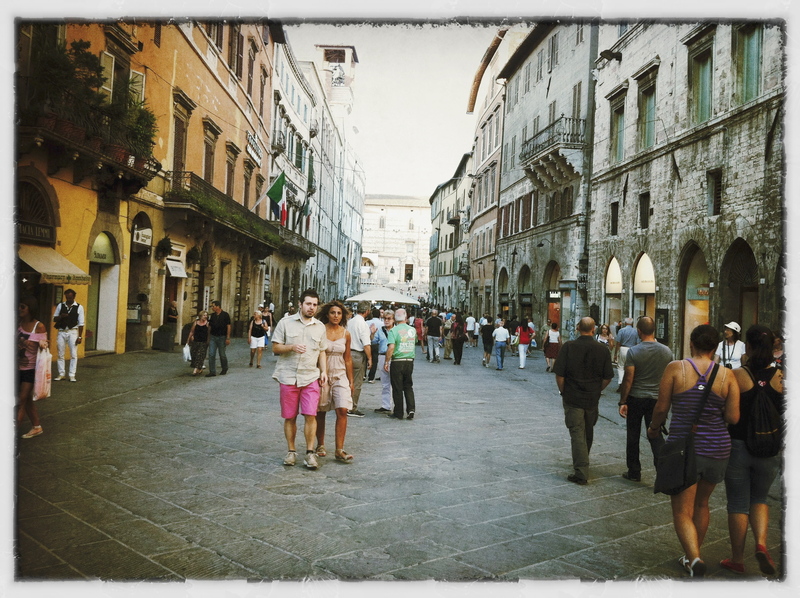 This is my favorite thing to do in Perugia. I love grocery shopping. I love that the fruit stand, fishmonger, butcher, baker, and deli are all within a five minute walk from our apartment. I only buy what I need for the day because 1. it’s too tiring to carry more than one bag up our six flights of stairs and 2. it’s just fun. It’s my best chance to practice the language, meet people, and learn how to cook the local dishes. This morning I started at Il Parma. 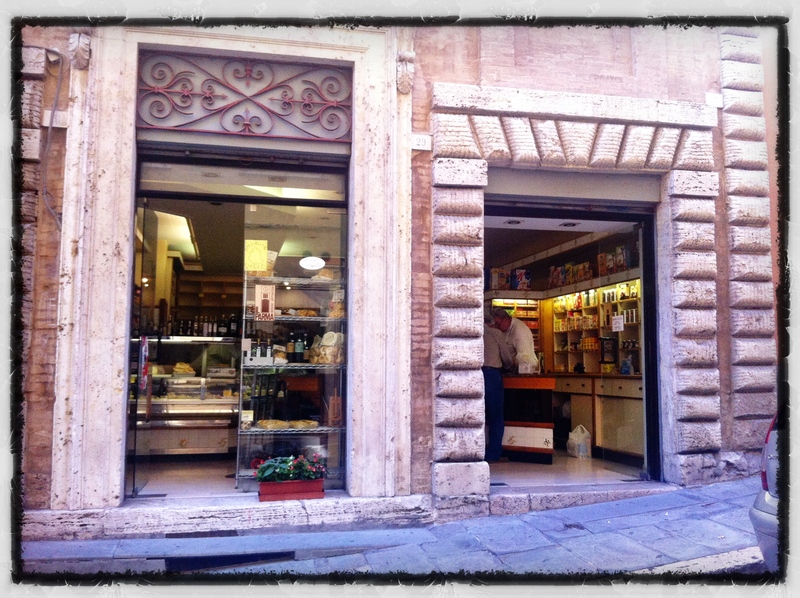 They sell cheeses, cured meats, drinks, pantry foods and dairy. The owner’s name is Armando. 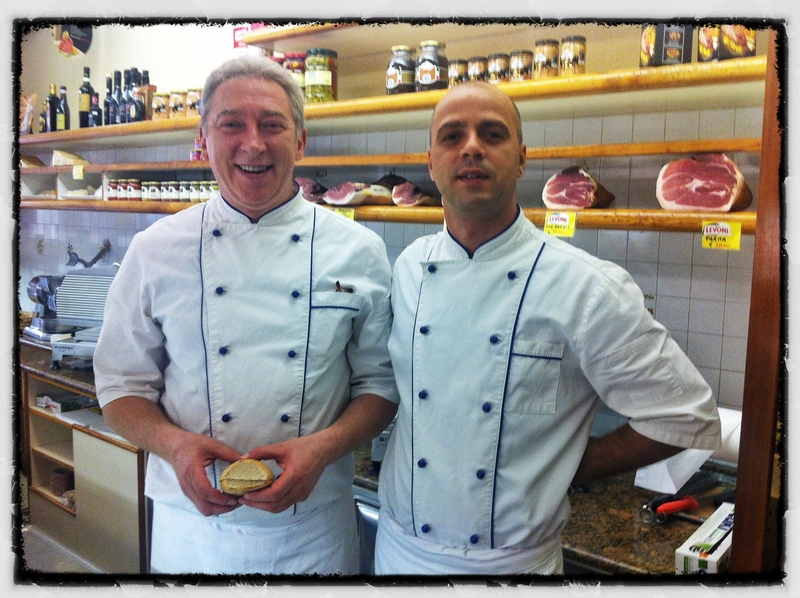 Near him, Alessandro slices meats, and Francesco rings up the bill. I don’t bring a grocery list anymore, I just tell them what I’d like to make. Armando told me he’s a great cook, so I just follow his directions. Today I wanted to make amatriciana, a simple red sauce. As he weighed seven thick slices of pancetta, he pointed out the type of pasta and tomato sauce I should buy. Then he explained how it was prepared: Heat a little olive oil in a pan and then add half of a small chopped onion. After a few minutes, cut the pancetta into small pieces and let it cook for five minutes with the onion. Then add a generous pour of white wine and turn up the heat until the alcohol burns off. Next, add a jar of tomato puree and let it simmer for an hour, adding water along the way so it doesn’t get too thick. When it’s dinner time, cook the spaghetti, and then add the drained noodles to the sauce with plenty of pecorino Romano. When I left, he said that next time, he’ll teach me how to make perfect spaghetti carbonara. Then I needed some meats and cheeses for our lunch. Alessandro sliced a couple of the boys’ favorite choices, then I pointed to an especially dark salumi and asked about it. 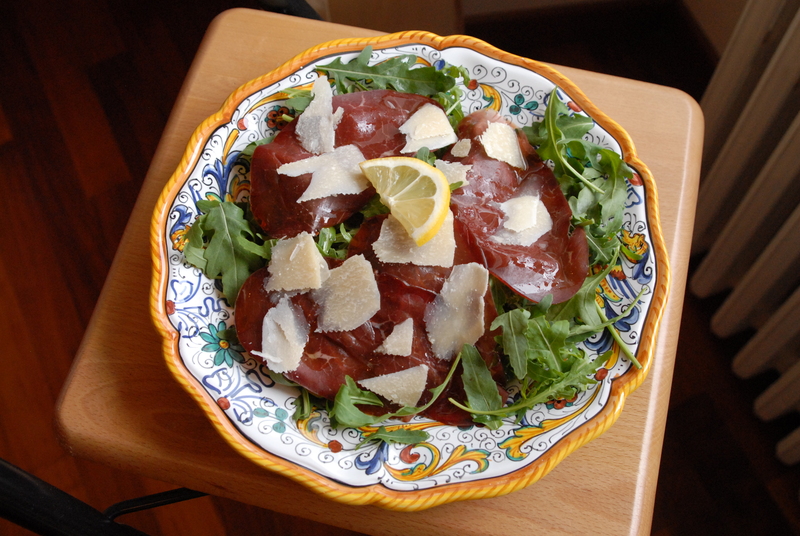 “That is bresaola. It’s cured beef, not pork. Serve it on a bed of arugula with shavings of Parmesan cheese and a drizzle of olive oil. You can finish it with squeeze of lemon,” he explained. On my way out the door, Francesco gave me the ingredients to make panna cotta, a cream based dessert served with fruit preserves. He handed me his recipe. Then I walked to the covered market which has a beautiful array of fruit and vegetable stands. I usually go to Grifo Fruta. 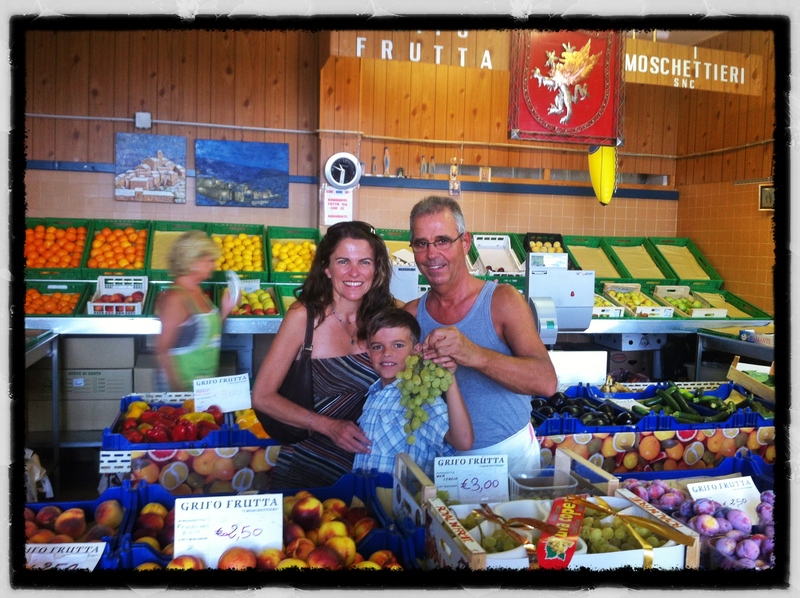 Marcello recognizes us and always offers the boys a peach or a banana. He gave Ray an entire cantaloup for his birthday. Again, I don’t bring a list. I ask him for suggestions. 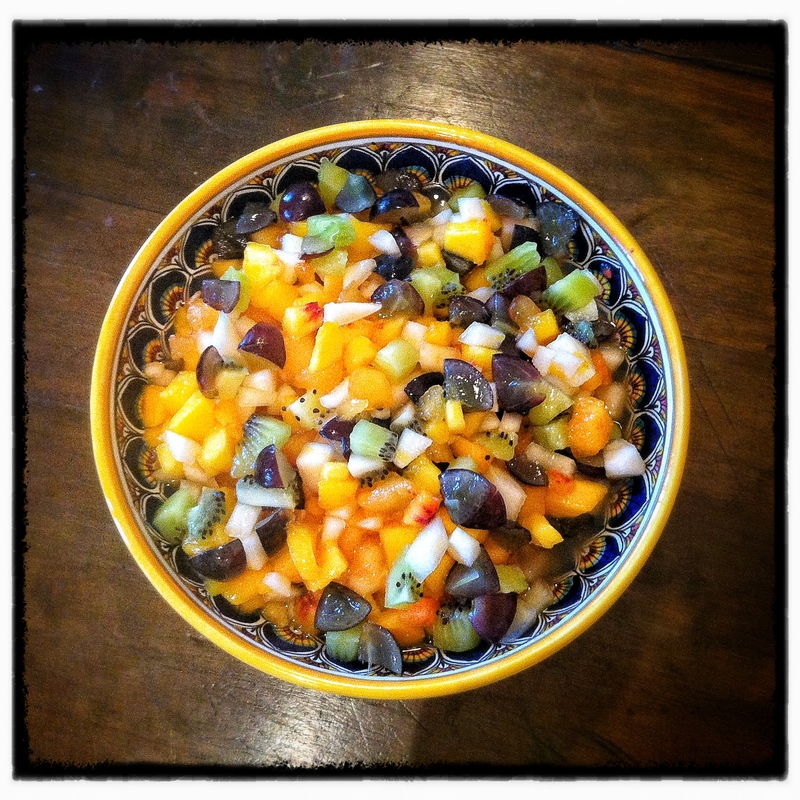 Lately, I’ve been loving fruit salads, called macedonia. If that’s what I’m making, Marcello fills a bag with plums, nectarines, kiwis, grapes, pears, peaches, and melon. He also adds a lemon and an orange for me to squeeze on top. We had the best macedonia in Mantua last week. The fruit salad was served in tiny cut-up pieces. It looked like a bowl full of jewels. That’s how I’ve been making it here in Perugia. We toss it with a couple tablespoons of sugar, and it makes a really good dessert. 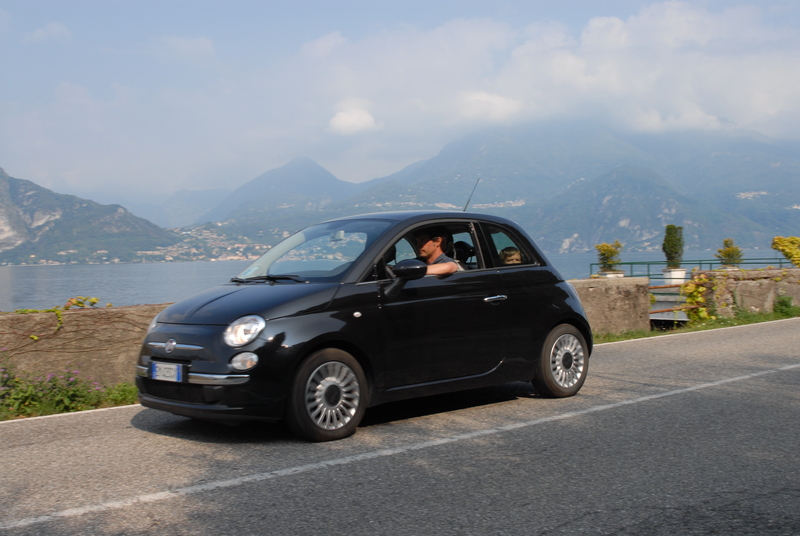 After two nights in Bologna, we drove nearly 3 hours north to Lake Como, and after a horrible 30 kilometer drive down a one-lane road with a million turns, we arrived at Bellagio (not the real Bellagio in Las Vegas, but the Italian Bellagio.) 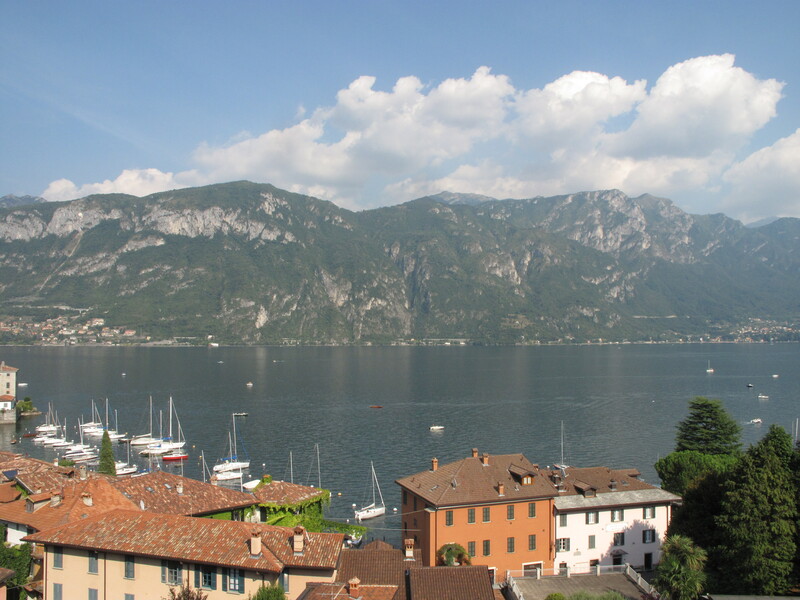 This little town rests at the tip of a lush green peninsula that jettisons into Lake Como. Our guide books pronounced Bellagio “the prettiest Italian town”. Truly, there is nothing like it. The lake is narrow and deep and long. The cliffs rise from the water into tall mountains. We are nearly in Switzerland, and it’s easy to imagine how the steep precipices morph into Alps. What Bellagio lacks in ancient ruins, Renaissance influence, and an adventurous atmosphere, it makes up for it all in pretty flowers and great food. 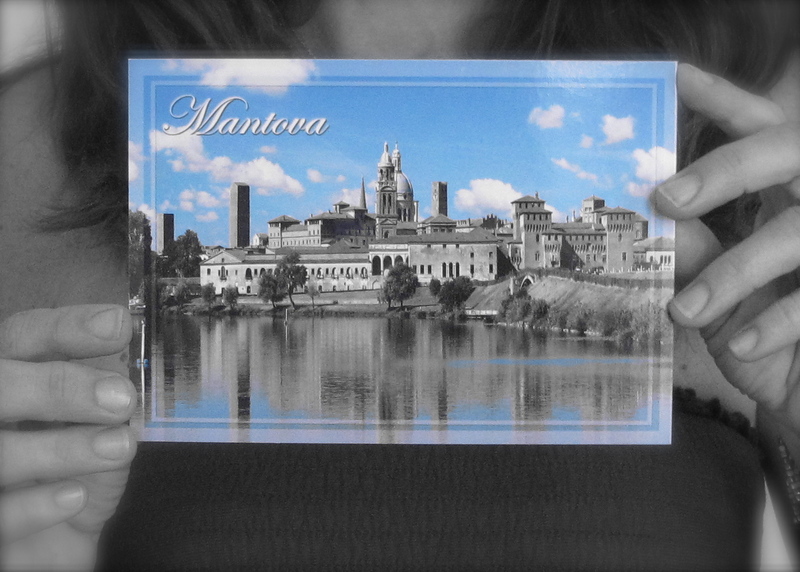 We ate fresh fish caught daily from the lake, the creamiest risotto ever, and a meat sauce that rivaled Bologna’s. And we always had an appetizer of gelato around 6:00. 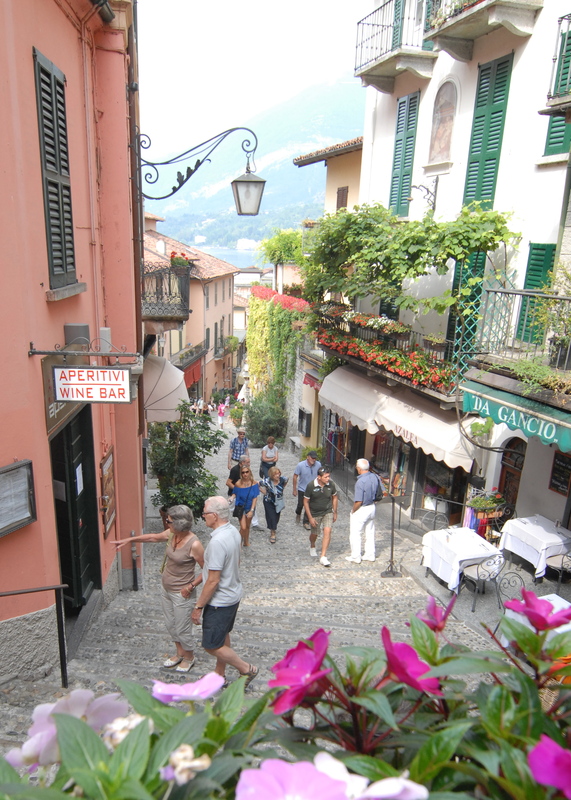 Most of the streets in Bellagio are actually wide fights of stairs, like this one. One of our favorite restaurants is on the right with the white table cloths. And I’m sure everyone is wondering about George Clooney. 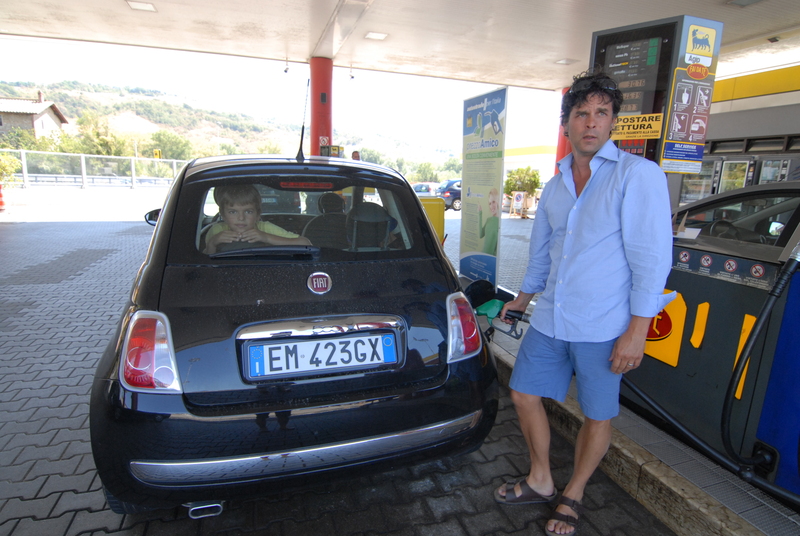 He has a villa somewhere nearby , but we failed to spot him. We did, however, hear a rumor among the locals that he is selling his house to Tom Cruise. Our first stop was Bologna, birthplace of . . . bologna! 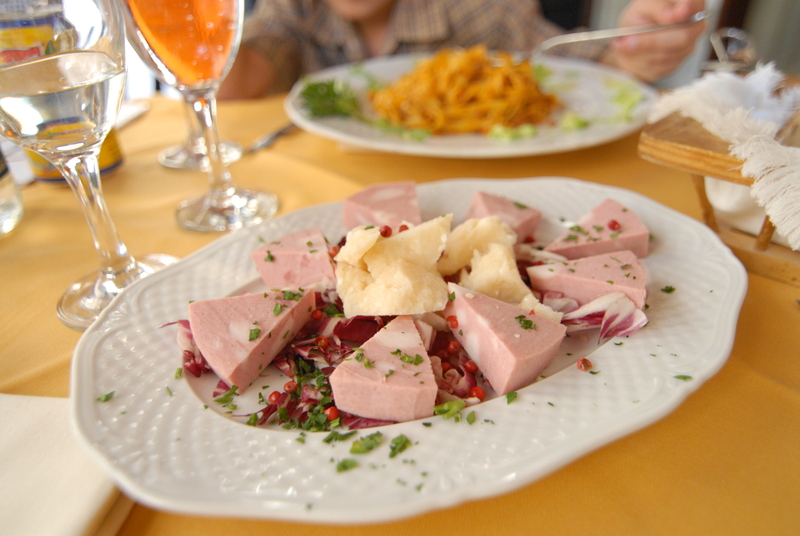 Yes, the ubiquitous pink lunch meat was invented here under the name “mortadella.” (However, I think that after the introduction to America, it underwent some unfortunate modifications.) Curious to sample the real deal, upon arrival, I ordered a plate of mortadella and Parmesan cheese. It was . . . actually, I was a little let-down. The Parmesan, however, was wonderful. It’s made nearby in Parma. Look beyond the boloney special. Notice the plate of deliciousness that Ray is eating. That’s spaghetti Bolognese. He had a hard time fighting me off. Bologna has several other specialties as well, one being tortellini. They are on the menu of every restaurant. The most common preparation is tortellini in brodo, a simple bowl of ricotta stuffed pasta in a rich, clear broth. 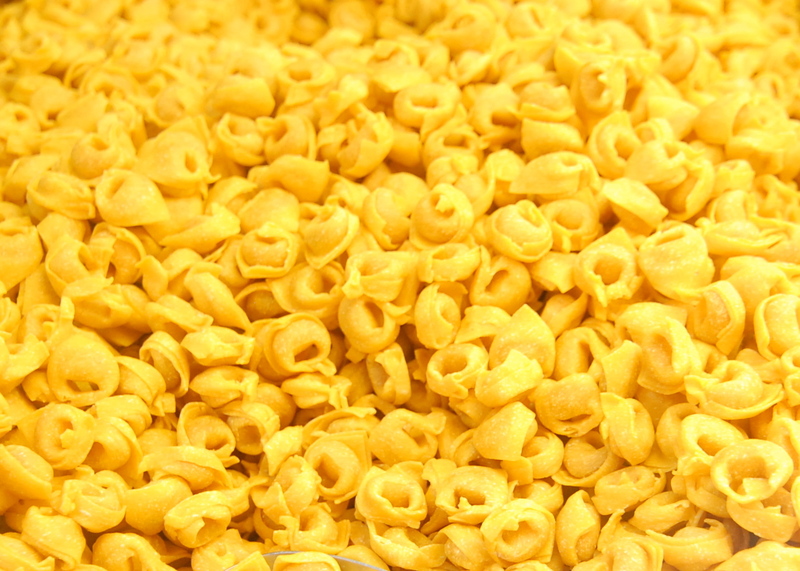 The origin of tortellini is actually pretty interesting. It turns out that hundreds of years ago (maybe thousands) Venus, the goddess of love and beauty, took a summer vacation to Bologna. After she checked into her hotel, she decided to have a little nap. The chef of a nearby restaurant heard that the famous goddess was staying, so he thought he’d introduce himself. But when he arrived at her door, he got nervous. Instead of politely knocking, he took a little peek through the key hole. Venus was asleep on her bed (naked, of course). The chef caught a glimpse of her belly button and was inspired to commemorate this delicate feature for his dinner. Thus, tortellini was invented. Did Venus have an innie or outie? 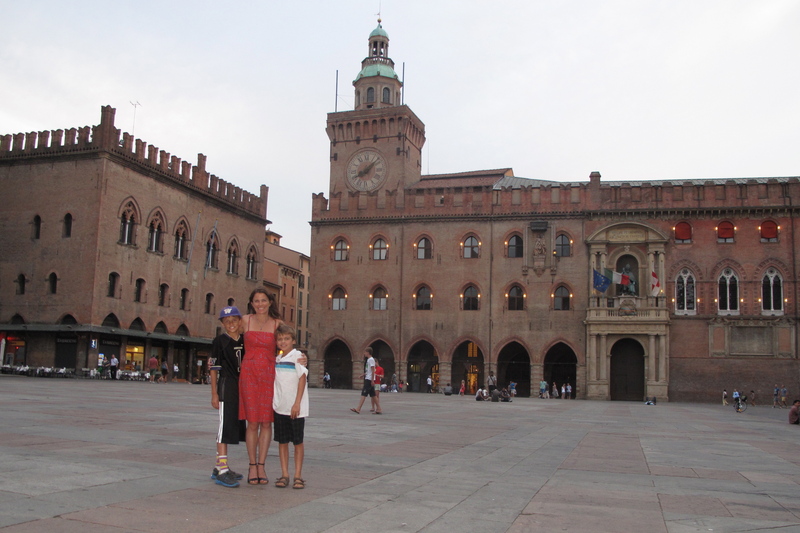 Besides eating, which we did a lot of in Bologna, we spent time sight seeing. We visited the Duomo, a massive unfinished church that was originally going to exceed the the size of St. Peter’s in Rome. 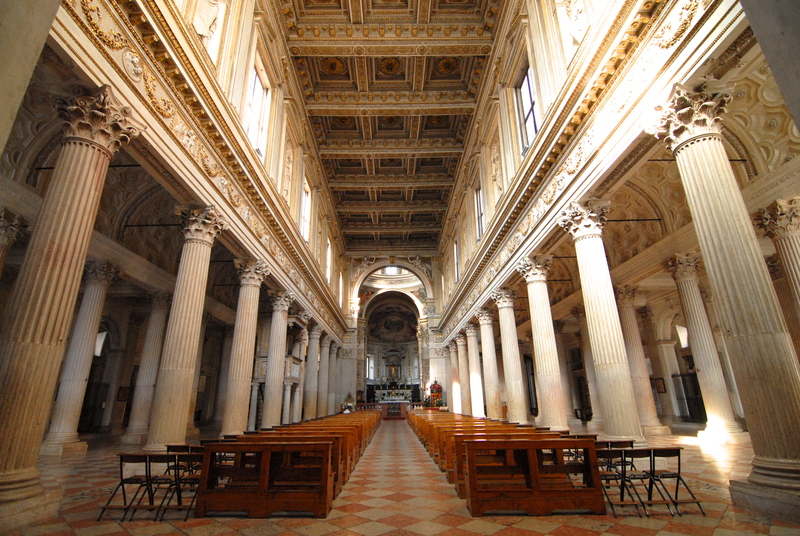 However, the church leaders decided to use the money to build Europe’s first university. But their motives were not entirely scholastic. The Pope was nervous about the scientific teachings that were taking place in the homes of the local professors. So the university was built as a way to monitor the lessons and make sure that no courses on astronomy were taught. (It was scandalous to consider that anything other than Planet Earth was the center of the universe.) As time went on, however, perspectives evolved. The university’s reputation expanded, and it became a prestigious center for learning. One of the most famous rooms in the university is the dissection room. 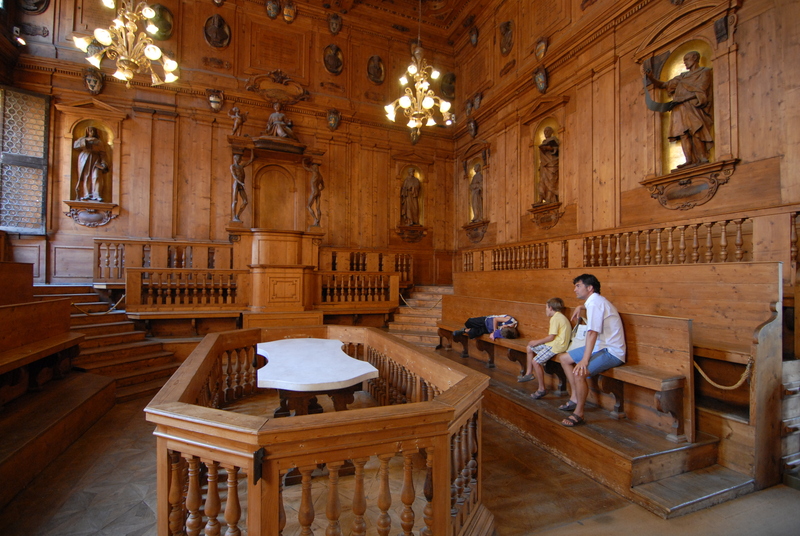 In here, one can sit around the table where dead bodies were opened up and studied. Among all these restaurants, markets, and famous buildings sit the two main piazzas in Bologna: Piazza Maggiore and Piazza del Nottuno. 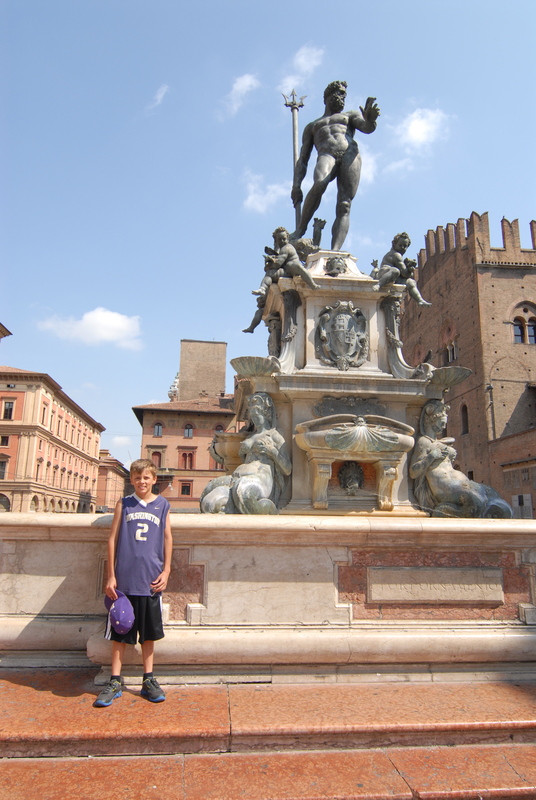 Here we admired the famous fountain of Neptune and his mermaids. 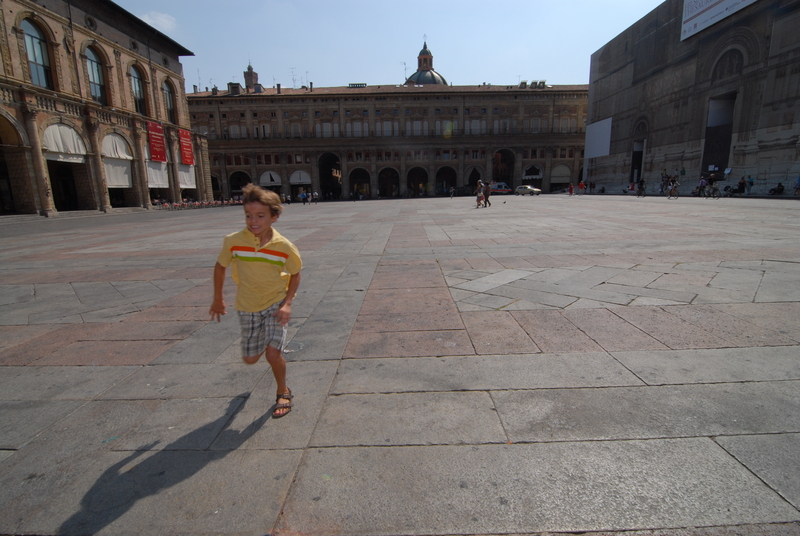 And here, Ray raced across the huge open square trying for a personal best. His record was 10.4 seconds. Make no mistake, if it were up to me, I would have chosen a charming medieval hill town to explore, maybe buy a postcard and a glass of wine. But I’m just one vote. 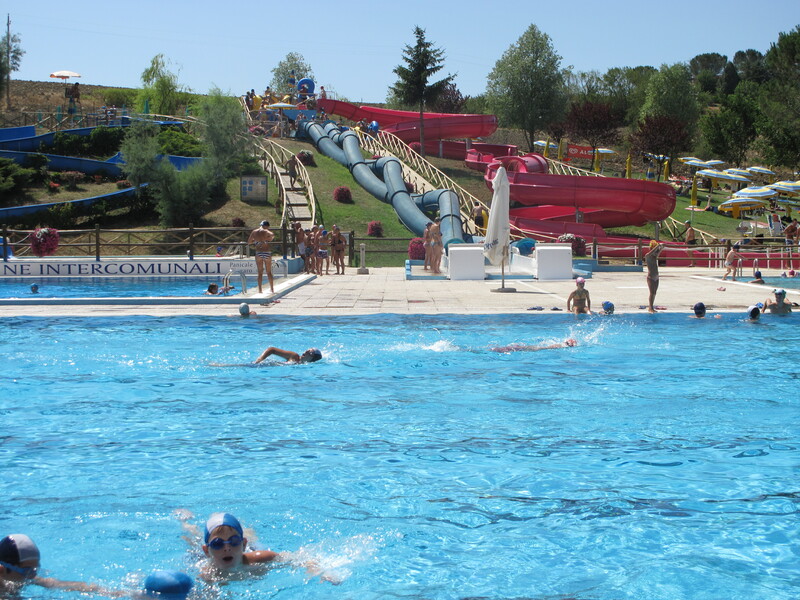 So on Thursday, we piled in the Fiat and drove to the Tavernella Water Park, just 25 minutes from our apartment. We arrived at this technicolor oasis in time to get one of the last umbrellas. 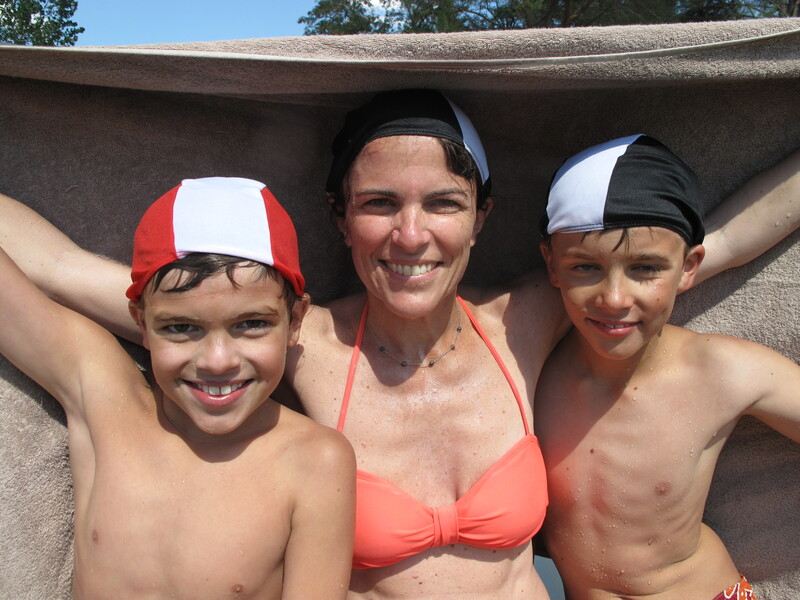 The boys quickly put on swim caps and headed up the hill to slide. Matt ordered us a cold glass of sparking wine while I unpacked our beach bag. A giant portion soon arrived in a keg cup. And here we played until closing at 7pm. I humbly admit that it turned out to be the best day we’ve had all week. The boys were super happy. 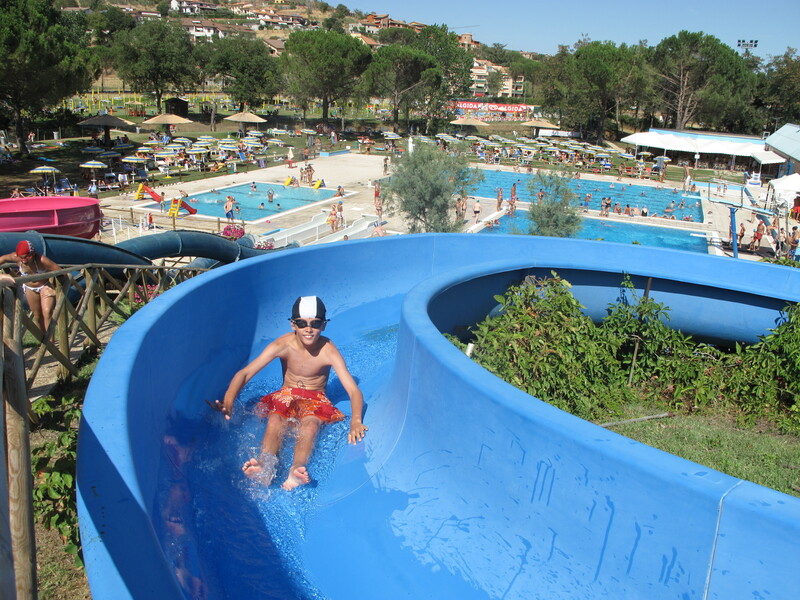 And the watersides were fast and fun.